Service Announcement: We are currently doing maintenance of the website. Some services may be unavailable during this time. To get started, please enter your first name and last name, then click next. , are you a member in good standing of the Miami Association of Realtors? Are you a broker or Agent? What is the name of the brokerage you own or work for? , we need to know your license numbers so we can validate your status as active with the Miami Association of Realtors. What is the brokers license number? What is your individual agent license number? What is the brokers street address? Could you please let us know where you are from? , for simplicity, we will use your email address as your username. Please enter your email address below. , this is the last and most important step, please let us know the password you would like to use to login on CraneSpotters.com. Make it a good one and remember to include at least 6 characters and 1 number. Congratulations , your account is created. Click Close and Login to return to your search. That's it , You've answered everything! We will now verify the information you provided. If correct, your account will be approved for realtor access within 48 hours. You can now enjoy standard access. Click here to start Searching The Database Now. DOWNTOWN MIAMI (Feb. 4, 2019) - More than 6,900 condo units are formally listed for sale in the South Florida county of Broward, according to a new report from Condo Vultures® Realty LLC. Based on condo sales of nearly 1,135 units monthly in the 12 months of 2018, Broward County now has more than a six-month supply of units available for purchase in the tricounty South Florida region of Miami-Dade, Broward and Palm Beach at the peak of the Winter Buying Season, according to the report based on data from the Southeast Florida MLS Matrix. A balanced market is generally considered to have about six months of supply. More months of condo supply listed for sale suggests a buyer’s advantage and less months typically indicates a seller’s advantage in the market. It is worth noting this report only tracks those Broward County condos formally listed for sale. The report does not factor in the nearly 47,500 new condo units currently in the development pipeline east of Interstate 95 in the tricounty region. Currently, about 1,390 Broward County condo units are under contract and waiting to transact - or pending - at an average asking price of nearly $315,950 each or about $216 per square foot, according to the statistics. The average asking price of a Broward County condo currently listed for sale is more than $388,150 per unit. This works out to an average asking price of $265 per square foot, according to the data compiled by CondoVulturesRealty.com. In the 12 months of 2018, the average transaction price of a Broward County condo was about $211,678 each or about $167 per square foot, according to the statistics. This means the current asking price of a Broward County condo listed for sale is more than 83 percent higher than the average transaction price achieved on a per-unit basis and nearly 59 percent higher than the average transaction price on a per-square-foot basis between January and December of last year. In the four quarters of 2018, the sellers who were able to unload their units needed about 84 days to transact a Broward County condo listed for sale. The current Days-On-The-Market average for a Broward County condo listed for sale is about 137, according to the statistics. The number of Days-On-The-Market for the Broward County condo units currently under contract - or pending - is about 111, according to the statistics. CondoVulturesRealty.com is a licensed Florida brokerage that specializes in assisting buyers and tenants in value-oriented condo acquisitions and leases in the tricounty region of Miami-Dade, Broward and Palm Beach. 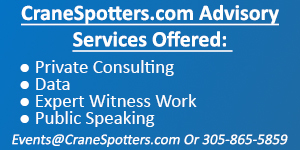 Users of CraneSpotters.com (whether using a free or paid account) agree and accept without recourse that details of condo projects published on this website may change over time and before the final completion of a development. Every effort is taken by CraneSpotters.com to ensure that this information is accurate and updated as timely as possible; however, the details cannot be guaranteed or warranted except by the developers. As such, Users of CraneSpotters.com agree to and accept without recourse that no refunds shall be requested of or granted by CraneSpotters.com, regardless of the subscription fees paid. For more information, please contact CraneSpotters.com at 305-865-5859.